This is an original glass slide that was sent to a movie theater in Green Bay, WI in 1917 & 1918 to show between films giving current news and events. This glass slide's caption is "So anxious are some of our men to mix in a real scrap that they find themselves unable to wait until they reach the trenches. These prizefighters are entertaining thrie comrades in camp." "Shown through courtesy of Joannes Bros. Company - Home of Martha Washington Pure Food Products". 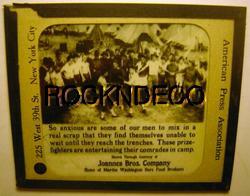 This glass slide was produced by the American Press Association of New York. The slide measures 3-1/4" x 4". The glass slide is in good condition - there are a couple hairline cracks which are on the inner glass as you cannot feel them from either side - the border tape in the upper left hand corner is a little torn. A NICE PIECE OF WORLD WAR I / NEWS / ARMY MEMORABILIA! Postage is $3.00.